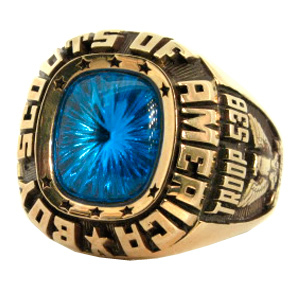 Personalize the Boy Scout Patriot ring with your choice of stone color, side emblems and engravings. The simulated stone is 12mm x 10mm. This ring is made of Golden Siladium and is officially licensed by the Boy Scouts of America. Golden Siladium is a fine jeweler's stainless steel with a bright gold tone. Contains 12% nickel. The Patriot ring is 21.4mm across the widest part on top; 30mm from top of stone to bottom of ring shank. Palm width: 6.4mm. Handcrafted in the USA. Enjoy ArtCarved's limited lifetime warranty. Enter your first name, year or troop. Backdates are available for an additional $20. The ring was everything that I wanted.